Premium seasoned Northern Maine hardwood conveniently stacked on a pallet, ready to load in your truck or trailer. 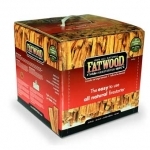 Each 2-way pallet contains 3 tiers of 16 inches split firwood, piled approximately 45 inches high and wrapped with a vented stretch film. This allows for good air circulation which helps ensure a dry, well burning product while keeping your firewood area neat and clean. Pallet weigh approximately 1500lbs and contain 1/3 of a cord or 43 cubic feet of firewood. Dry kindling to start your fire! Bark and insect free, these kiln dried lumber pieces are split small for rapidly starting fires. Certified for shipment to all states. 100% all natural firestarter, harvested from the stumps of resinous pine trees. Takes only two sticks to start a fire in your fireplace, barbecue, campfire, or woodstove. No chemicals, no mess, no hassle!